"Marie, we want to thank you for our beautiful 25th Wedding Anniversary Vow Renewal Ceremony...It surpassed anything we had imagined it could have been! You are wonderful! Still in love after all these years? Ready to recommit yourselves to each other? I feel Vow Renewal Ceremonies are "extra special". To me, there is nothing more romantic than to celebrate the love, life and history of two people who are ready to say "I Do" all over again! 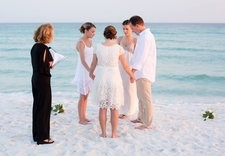 My vow renewal ceremonies ignite emotions and create new memories. Thinking of having your children involved in the ceremony? Absolutely! They are a part of your lives, arent's they? It's important to me that the children feel special. I will work with you to orchestrate a perfect flow of words and appropriate participation from those involved. Once upon a time, you created a memory that brought you to where you are now. Allow me to create a new memory to take with you as you continue on your journey together. "Marie, Thank you for the beautiful ceremony. You exceeded my expectations and made it possible for long lasting memories. You are special! Blessings to you." 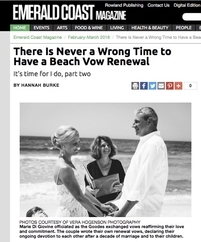 Emerald Coast Magazine interviewed me for their article on Beach Vow Renewal Ceremonies, which appears in their February 2018 issue. I absolutely love this article and so honored to be chosen for the interview! As an Officiant, I dedicate myself to creating your script and conducting your ceremony. I do not offer any "packages". However, I work with many wonderful vendors, and I will be happy to send them your way should you need them. Copyright 2010 Wedding Ceremony By Marie/Marie Di Giovine. All rights reserved.